Your nervous system controls and regulates every cell of your body. When your nervous system doesn’t work right, you don’t work right. And when you don’t work right, you’re sick! Simple as that. 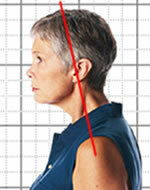 Nerve compromise can result from postural distortions that are easily revealed with a few simple tests. Consult a professional for evaluation! Simply study the pictures, follow the directions and conduct the tests. If the results indicate that you or a loved one may be a good candidate for chiropractic care, contact Bernius Chiropractic to arrange a thorough examination in our practice immediately. 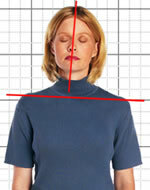 Notice if one shoulder is higher than the other or if the head tilts to one side. Both could be indications of the types of problems that respond nicely to chiropractic care. A common problem is a forward leaning head. Besides a source of fatigue, this is a common sign of neurological compromise in the neck, shoulders and into the arms and wrist.